‘Now I’m Forty’ (Dan Mata Hathalihai), written by senior journalist Ashoka Piyaratne is about a media personality that can be emulated. It is a story about the power of the media to bring about change and real-life experiences where true results of communal harmony and reconciliation are starkly evident. It is about the life of a simple man made powerful by his ability to talk to people’s hearts. Senior journalist Seelaratne Senarath deserves all the accolades that were showered upon him at the launch of the work of Piyaratne that describes the life of this great personality who marks 40 years in the media field while touching the lives of many. The book in itself is a work of art with a captivating opening, taking the reader through the baby steps of Seelaratne Senarath that made him into the man he is today, and finally leaving the reader with a feeling of warmth. What is special about the work is that it does not talk about a life of grandeur but instead, narrates the story of overcoming barriers and winning people with a smile. Those who gathered at the Western Province Aesthetic Centre in Colombo last week to attend the launch of Dan Mata Hathalihai, had one thing in common – a feeling of real connection with this simple man. The book launch was in parallel with the third anniversary of China Radio International (CRI) Sri Lanka FM 97.9, the Sri Lankan branch of CRI Sinhala Service aired from Beijing, China where Senarath now serves as the Director of Programming. 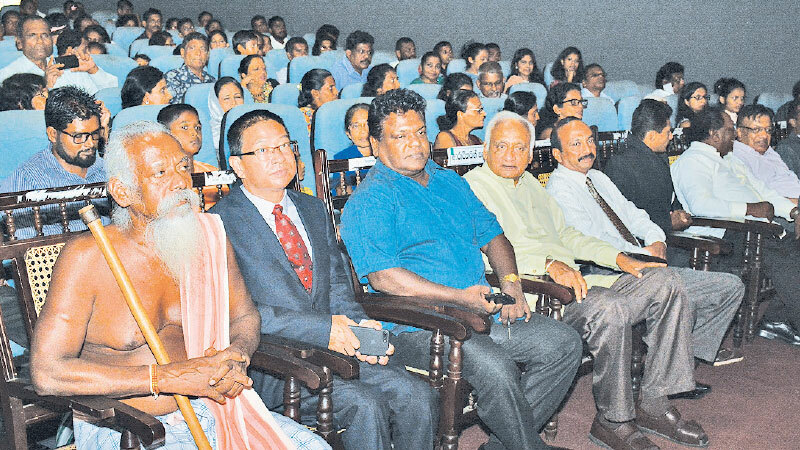 The chief guest – chosen by Seelaratne Senarath himself, and invited to the event by paying him a special visit to Dambana – was the Adivasi Chief Uruwarige Wannilaththo. “I was a close friend of the previous Adivasi Chief Uruwarige Tissa Hami from a long time ago when Uruwarige Wannilaththo was a child. I have done many radio programmes with both of them and we have mutual respect for each others’ work. I admire Chief Uruwarige Wannilaththo for protecting his community and preserving his traditions. We need to be proud of our identity and be humble about our roots. That is why I thought of requesting him to grace the occasion,” Senarath told the Daily News. 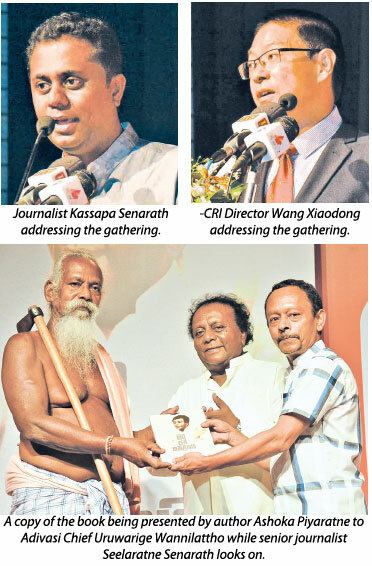 Among his well-wishers at the gathering were popular artistes Sathischandra Edirisinghe, Edward Jayakody, Niranjala Sarojini and Kusum Peiris, Sabaragamuwa University’s Dr. Samitha Hettige, former Lake House Chairman Bandula Padmakumara, former SLBC Chairman Hudson Samarasinghe, former judge T. D. Rajapakshe, President’s staff member K. Ariyatunga, popular Dhamma talk facilitator L. R. Ariyananda and others. Journalist Kassapa Senarath, having strong links to China through his six years of education there, highlighted the role of CRI and its beginnings. He had also served at CRI while in China. “CRI began as ‘Radio Peking’ in 1941 during the time of Mao Zedong who launched it as the propaganda wing of the Long March. China identified Sri Lanka as a friend with the latter’s recognition of the People’s Republic of China at the time when the UN recognized Taiwan. With the visit of China’s first Premier Zhou Enlai to Sri Lanka, the initiative was made to create CRI Sinhala Service that launched in 1975, where Chinese broadcasters announced in Sinhala with Sinhala experts brought from Sri Lanka. It aired Sinhala programmes for Sinhala speaking listeners around the world. Later, in 2015, CRI Sinhala Service came to Sri Lanka with the opening of its branch in Colombo,” Kassapa Senarath recalled. Thus, last Thursday was a double celebration of a popular media personality who also served at CRI Sinhala Service from 2002 – 2005 in Beijing and the anniversary of the latter’s Sri Lanka branch where Senarath now serves. Senarath was former Director Editorial of Lake House and spearheaded the setting up of Dinamina Radio, the launch of Vanna Vanavil newspaper for the Jaffna peninsula and commencing Tamil classes for Lake House employees. Attorney-at-law Katchi Mohamed, former Additional Commissioner of the Education Ministry, recalled the special moments he shared with Seelaratne Senarath. Mohamed related an incident when he was a part of the team when Senarath had to broadcast an Avurudu Ulela in Vanni at the height of the war. The duo, when visiting a bunker to boost the morale of soldiers in fighting, had found that EPRLF fighters were sheltered in another bunker. Until then, the two fighting parties had not uttered a word to each other. But it was after Senarath spoke to them in Tamil and shared the sweetmeats with them, that they had finally started to interact with the soldiers. “Seele is a humanitarian. He not only speaks three languages, but speaks as though he is one of them. It is not only that he speaks the Tamil language, but he uses it in such a way that the Tamils love him. This is because Seele does not see the Tamils as the ‘Other’ but thinks of them as ‘us’. This is the meaning of true reconciliation and the power of a journalist to make a change. Piyaratne’s book, therefore, is like a manual for budding journalists,” Mohamed stressed. Senarath’s 40 years in media had been a time of many trials, many tribulations and much triumph. As he himself says, he has no regrets as most of all; his greatest achievement was earning the love of the people.